Quidditch, for those not familiar with the books or movies about the boy wizard Harry Potter, is the national pastime of that magical world, a game played entirely on flying broomsticks with enchanted balls that have minds of their own. Muggle quidditch, first played at Middlebury College in 2005, is the earthbound version (“muggle” being the Potteresque term for nonwizards). Players hold sticks between their legs to symbolize brooms, and the five balls in the game are propelled by muscle, not magic. Sturm, a third-year dental student, began playing quidditch with high school friends in 2010 and joined the Tufts team, the Tufflepuffs, as an undergraduate in 2012. He has become one of the sport’s biggest proponents. He founded and is managing editor of a website about the nascent sport called, in a nod to the seven players on a team, The Eighth Man (www.eighthman.com), and last summer cofounded Major League Quidditch, which, while not a professional organization, is attracting some of the best players from both college and community teams. He’s trying to grow quidditch into a serious sport, and in that regard, the esteemed fantasy novels are both a help and a hindrance. The Harry Potter angle definitely gets people’s attention, Sturm says, particularly on college campuses. But Sturm could do without the perception that quidditch is soccer for nerds. While he is a fan of the books and has read them multiple times, he is foremost a sports junkie, both playing and watching. He wrote for the sports section of the Tufts Daily all four of his undergraduate years. It was quidditch’s mix of rugby, lacrosse and dodge ball elements that drew him in. He also likes that the game is decidedly coed, with each team allowed no more than four players of the same gender on the field at a time. The sport has certainly shed some of its fantasy trappings from its early days. Eight years ago athletes wore capes when they played, and loose broom bristles littered the field at the end of every game. Now team uniforms mimic soccer gear, and functional brooms are being replaced by sleek PVC sticks. (“It’s very uncomfortable to play with a real broom,” Sturm explains, referencing an ailment called “bristle burn.”) But brooms could never leave the game entirely, Sturm argues, as they are a defining handicap, like dribbling in basketball. Some of the best players, he says, have never even read a Harry Potter book. They come to it from a variety of sports backgrounds: softball, football, basketball. The best teams are in Texas, he says, where four practices a week plus workouts are typical for players. “They are just in incredible shape,” he says, which certainly helps when you are dodging bludgers (red kickballs), lunging for the quaffle (a slightly deflated volleyball) or being tackled by a keeper (goalie). Players do get hurt, Sturm notes in trying to point out how physically demanding the game is without sounding proud of the injury rate. So how do you turn a fictional game into reality? 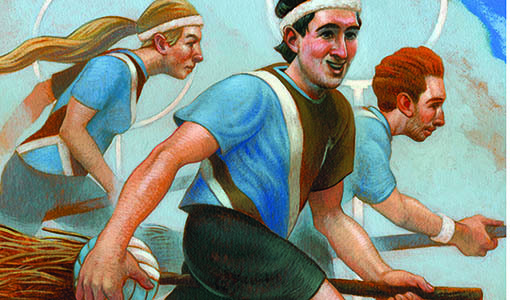 In the books, a match would end when the seeker, usually Harry Potter, caught the snitch and earned 150 points for his team. “Obviously, we don’t have a 150-point snitch. That was just so that Harry Potter could be the most important person on the field. We all know that,” says Sturm, who himself has always played the position of chaser, similar to a forward in soccer. In muggle quidditch, catching the snitch still ends the game, but it is worth a reasonable 30 points. The snitch is a neutral player who tries to avoid capture by either team; “capture” means grabbing the tennis ball in a tube sock that dangles from the back of the snitch’s shorts like a tail. Practical or prosaic, depending on your point of view. Watching a game is a bit like watching a three-ring circus. With up to five balls in play at a time, it is hard to know where to look, and it takes four or five referees to officiate. The chaos was part of the enticement for Damaris Pock, 22, an au pair from Austria who was among the couple hundred spectators who turned out for a Major League Quidditch game between the Boston Night Riders and the New York Titans in August. She heard about the game from a friend and decided to bring the two boys she babysits. An avid Harry Potter fan, she showed up wearing a Hogwarts T-shirt and her Deathly Hallows earrings and not really knowing what to expect. Within minutes, she was hooked. “I would totally play,” she said. But does it look like the quidditch described in the books? Her ward Ezra, 7, the only one in the crowd wearing a Harry Potter cloak, scanned the field where the athletes were running, jumping and dodging, but undeniably not flying. Sturm would be OK with that.